The Bon Secours Private Hospital in Dublin is an independent acute care hospital located in Glasnevin in North Dublin providing medical care to patients from Dublin and across Ireland since 1951. The opening of the hospital followed a request by Archbishop John McQuaid in 1944 who invited the Bon Secours to establish a hospital in Dublin. Building work commenced in 1947 and the hospital officially opened its doors on 2nd February 1951. Up to that point the Bons were a low key order in Dublin, although the foundation had arrived in Ireland in 1861. Today some 66 years later, the hospital continues to be a very much embedded in the local community of Glasnevin and North Dublin. Patients are referred from the 32 counties and beyond and the hospital continues to be a leader in the provision of excellence in healthcare in Ireland. In 2002, the hospital was the first internationally accredited hospital in Ireland when it achieved JCI Accreditation. 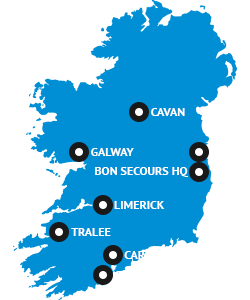 The hospital set the standard for all Private Hospitals in Ireland and all hospitals are now required to be JCI accredited. In 2016, the hospital achieved another first when it became the first private hospital to achieve JAG accreditation of its endoscopy unit which is widely recognised internationally as the gold standard for endoscopy units. The hospital is renowned for the quality of medical service provision and combine the latest medical technologies and approaches with traditional values, compassion and personalised medical care. The hospital provides a range of tests, examinations, surgical and medical services on an inpatient, day case and out patient basis. Most outpatient consultations may initially be to see one of our consultants following a referral from your GP or directly from your GP for a particular examination or procedure. A comprehensive range of services available including radiology, blood testing, physiotherapy, diabetic care, endoscopy, dietetics, dermatology, minor surgery etc. ….and the assurance of a warm welcome in comfortable and relaxed surroundings provided by a highly experienced and dedicated medical team.